Franz Joseph "Papa" Haydn was one of the most important pioneers in the development of classical music. He was the creator of the classical symphony. He gave the future great masters much to study from as he wrote an amazing 104 classical symphonies. That is not all. This great composer did in the development of classical music. He also developed the sonata form style that became a staple of classical music. Papa Haydn also was a leader in developing the string quartet. He was prolific in his string quartets and it led the way to the great string quartets from the masters that followed Haydn's lead. His great string quartet in C Major is called the Emperor because Haydn uses in the second movement the theme "God Save Emperor Francis" which was an anthem he wrote for Emperor Francis II. Don't confuse this with Beethoven's great fifth piano concerto which is also called the Emperor. This C Major quartet has a beautiful melodic second movement that is scored poco adagio, cantabile, meaning slowly in a singing style. It is scored in the theme and variations style. 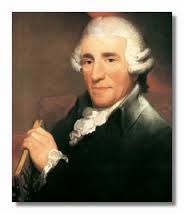 So, please turn up the volume and enjoy this peaceful music from Papa's Emperor, Franz Joseph Haydn that is.